I’m not gonna lie, it takes a lot to get me out of bed early these days and so it was with a definite grumble and bleary eyes that I dragged myself to my couch at 4:55 am on Friday to get my first taste of the Fallout 76 beta test. I’ve been a huge fan of the Fallout series and survival/crafting games for a long time, so I was more than keen to see what would happen when these two worlds collided. It’s a little bit worrying that the ‘Break-it Early Test Application’ is happening so close to release, given that both Bethesda games and this genre usually have quite a few bugs to work out, but after spending a few hours wandering around the Appalachian wasteland, I have faith that it’s going to turn out pretty awesome. Since I’m going to be reviewing the full game when it’s released next week, I’m going to keep my opinions of the beta test brief and approach it with an open mind. My immediate and general reaction is that I enjoyed myself. The game is by no means perfect and is honestly a bit strange, but it definitely has the hallmarks of something that I could sink a lot of hours into. 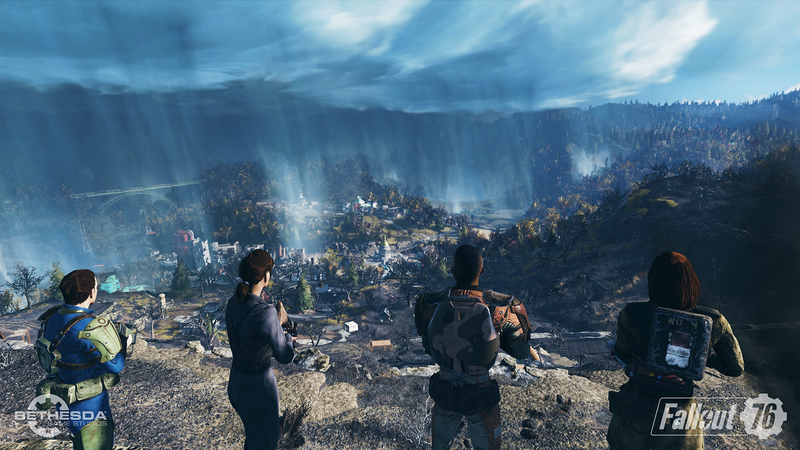 In the short time I had to explore the bombed-out West Virginian countryside, it felt like a Fallout AND a survival /crafting game, but also not entirely like either of those. It had the charm, lore, aesthetic and gameplay mechanics of a contemporary Fallout title, but lacked the engaging world and characters you find within it. It had the tense personal upkeep, player interaction and creative delights of something like Ark: Survival Evolved or Conan Exiles, but also imposed a lot of restrictions not found in those games. Bizarrely, I actually think that it’s within this unique duality that Fallout 76’s greatest strengths and greatest weaknesses lie. I love that it felt like a Fallout game. Waking up in a functioning (albeit empty) vault was awesome and the prospect of rebuilding society is exciting. Seeing other players in all manner of post-apocalyptic outfits, scampering around burnt out buildings and teaming up to take out radroaches is something that I’ve wanted for ages. Looting everything in sight and grinding it down to parts for my flashy new settlement was intensely satisfying. Hell, even getting followed around and accosted by a douchey player was thrilling since I still felt in control the whole time. What I didn’t like was that even with a full server, it still felt a little sparse. I miss the interesting characters and although the world is full of audio diaries and other tidbits of personal narratives, it’s just not the same. I also didn’t like that I couldn’t just walk up to a tree and punch it for wood (damn you, Minecraft!). I also have an immediate negative impression of microtransactions in games, so I’m hoping that the ‘atom’ currency in this doesn’t become intrusive, even if it is just for cosmetic things (building a base is all about the lewk, honey). As I said, I’m going to reserve a definitive opinion on the game for when I review it but suffice to say that I was mostly impressed by the beta, even if I did have to get up at 5 am to enjoy it. Prepare for reclamation day Vault-Dwellers!